148:6.2 "My son, you do not comprehend the meaning of adversity or the mission of suffering. 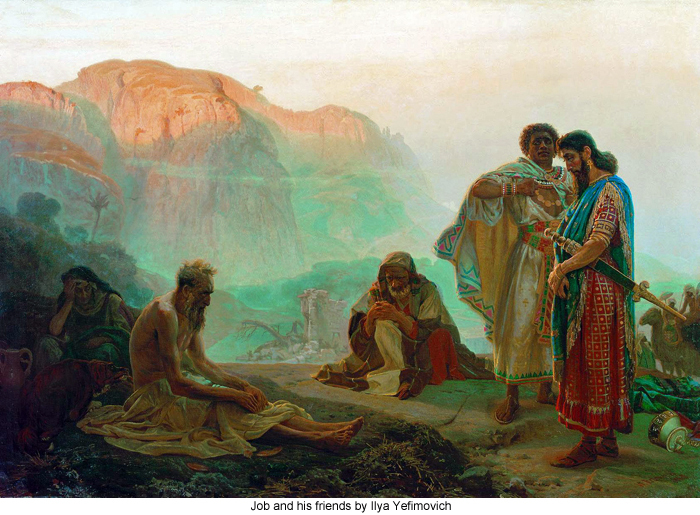 Have you not read that masterpiece of Semitic literature-the Scripture story of the afflictions of Job? Do you not recall how this wonderful parable begins with the recital of the material prosperity of the Lord's servant? You well remember that Job was blessed with children, wealth, dignity, position, health, and everything else which men value in this temporal life. According to the time-honored teachings of the children of Abraham such material prosperity was all-sufficient evidence of divine favor. But such material possessions and such temporal prosperity do not indicate God's favor. My Father in heaven loves the poor just as much as the rich; he is no respecter of persons. 148:6.3 "Although transgression of divine law is sooner or later followed by the harvest of punishment, while men certainly eventually do reap what they sow, still you should know that human suffering is not always a punishment for antecedent sin. Both Job and his friends failed to find the true answer for their perplexities. And with the light you now enjoy you would hardly assign to either Satan or God the parts they play in this unique parable. While Job did not, through suffering, find the resolution of his intellectual troubles or the solution of his philosophical difficulties, he did achieve great victories; even in the very face of the breakdown of his theological defenses he ascended to those spiritual heights where he could sincerely say, 'I abhor myself'; then was there granted him the salvation of a vision of God. So even through misunderstood suffering, Job ascended to the superhuman plane of moral understanding and spiritual insight. When the suffering servant obtains a vision of God, there follows a soul peace which passes all human understanding. 148:6.4 "The first of Job's friends, Eliphaz, exhorted the sufferer to exhibit in his afflictions the same fortitude he had prescribed for others during the days of his prosperity. Said this false comforter: 'Trust in your religion, Job; remember that it is the wicked and not the righteous who suffer. You must deserve this punishment, else you would not be afflicted. You well know that no man can be righteous in God's sight. You know that the wicked never really prosper. Anyway, man seems predestined to trouble, and perhaps the Lord is only chastising you for your own good.' No wonder poor Job failed to get much comfort from such an interpretation of the problem of human suffering. 148:6.7 "And who can challenge the attitude of Job in view of the counsel of his friends and the erroneous ideas of God which occupied his own mind? Do you not see that Job longed for a human God, that he hungered to commune with a divine Being who knows man's mortal estate and understands that the just must often suffer in innocence as a part of this first life of the long Paradise ascent? Wherefore has the Son of Man come forth from the Father to live such a life in the flesh that he will be able to comfort and succor all those who must henceforth be called upon to endure the afflictions of Job. 148:6.10 "Job was altogether right when he challenged the doctrine that God afflicts children in order to punish their parents. Job was ever ready to admit that God is righteous, but he longed for some soul-satisfying revelation of the personal character of the Eternal. And that is our mission on earth. No more shall suffering mortals be denied the comfort of knowing the love of God and understanding the mercy of the Father in heaven. While the speech of God spoken from the whirlwind was a majestic concept for the day of its utterance, you have already learned that the Father does not thus reveal himself, but rather that he speaks within the human heart as a still, small voice, saying, 'This is the way; walk therein.' Do you not comprehend that God dwells within you, that he has become what you are that he may make you what he is!" 148:6.11 Then Jesus made this final statement: "The Father in heaven does not willingly afflict the children of men. Man suffers, first, from the accidents of time and the imperfections of the evil of an immature physical existence. Next, he suffers the inexorable consequences of sin-the transgression of the laws of life and light. And finally, man reaps the harvest of his own iniquitous persistence in rebellion against the righteous rule of heaven on earth. But man's miseries are not a personal visitation of divine judgment. Man can, and will, do much to lessen his temporal sufferings. But once and for all be delivered from the superstition that God afflicts man at the behest of the evil one. Study the Book of Job just to discover how many wrong ideas of God even good men may honestly entertain; and then note how even the painfully afflicted Job found the God of comfort and salvation in spite of such erroneous teachings. At last his faith pierced the clouds of suffering to discern the light of life pouring forth from the Father as healing mercy and everlasting righteousness."